A photograph of the local GNR crew (I presume …?) at Bottesford, Station. My great grandfather, Thomas Christmas, father of Bill Christmas (Christmas and Chorlton Garage) is on the ground front row right. Anyone have any idea of date or other individuals? 1920’s? 1930’s? I know I am late offering an opinion as to the ‘era’ or date of this lovely group photograph but having seen many dated photographs like this one I would say it was taken between 1898 and 1910. I am looking carefully at the style of the uniforms, the different neckwear – some staff wear ties and some a formal scarf indicating their job title. Notice too the american style ‘cheesecutter’ hats, the moustaches and the beards. There’s a distinctly late Victorian and Edwardian look and feel about these people. Another indication of the date is the track ballast. Until about 1910 the Great Northern Railway Company used coal ash as track ballast and this covered the sleepers as you can see in this picture. This is the work of an early, and very competent, professional studio photographer. It is not a snapshot but a very carefully planned occasion using the very latest photographic equipment. In those days a photograph such as this would be taken using a heavy camera made from hardwood, with leather bellows and large glass lenses held in precision engineered brass tubes and the whole thing would run on an adjustable traverse. The instrument would be mounted on a heavy collapsible tripod. The scene or image would be captured on a large glass plate coated in light sensitive chemicals and processed or ‘developed’ afterwards in a darkroom back at the studio. 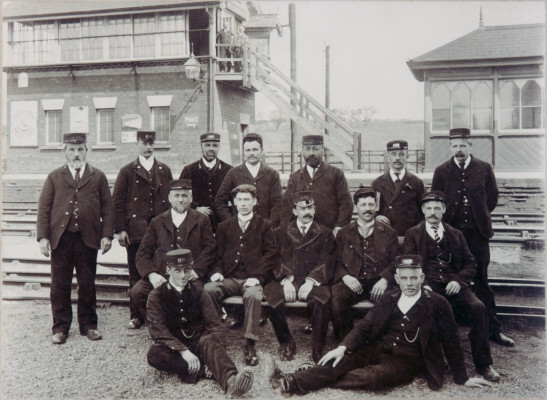 Group photographs of railway employees were very popular in the early years of the 20th century. The photographer may have asked the Station Master if he and his staff would like to purchase prints from the plate. On the other hand the Line Superintendant at Grantham or Nottingham may have organised a photo ‘shoot’ at each station along the line. It is not impossible to imagine that no one in Bottesford would have a camera. Taking part in a group photograph would be a big deal. You can begin to appreciate the anticipation of a special event building up amongst the station staff in the days before the photographer arrived – probably by train. – laden with very heavy equipment and including a special light-proof case in which the glass plates would be carried. The staff would be gathered, after the camera had been set-up, and politely asked not to cough or move their heads or hands for perhaps 5 long seconds. The correctly exposed ‘plate’ here shows the detail in those black uniforms and throws the staff into relief against a deliberately over exposed signal box and platform shelter. The darkroom magic has worked! Thank you very much for these helpful observations on the dating of this photograph. PS: She cannot believe how the village has grown and changed so much. She would like me to thank you ALL so very much for allowing her to see her old home etc again. Dear Barbara, thanks for your warm comments, and please pass our best wishes to you mum. As you know, we have taken a look to see what we can find out about William Dent and his service in WW1. He was a rifleman with the London Regiment, having enlisted in 1915 after leaving Bottesford and moving to Essex. Taking this into account alongside Peter Mackness’s comments, we can estimate that this photo was taken around 1910-1911, possibly the mark the accession of King George V. We also know that William’s father, Thomas Dent, was also a railway worker, and it is tempting to suggest that it may be him sitting to William’s left (as seen in the picture). With best wishes, Neil Fortey. I have now got G Uncle Will’s attestation papers and his casualty/medal records etc. many thanks (would you pass my thanks onto Sue Middleton for her email about them? Very grateful to her). My G Grandfather, Thomas Dent (married to Susannah Cree from South Muskham) was a platelayer and also was awarded a medal along with another gentleman (I can’t put my hand on the newspaper clipping right now sorry) for his work in Bottesford during WWII for his work in the ?????Territorials?? Mum says he worked very stubbornly until only the last few months of his life in 1944. Sadly, he had stomach cancer, and Mum says her mother (Maria Dent) was incensed that he refused to rest. Men! Mum says her grandfather would have been very difficult to miss – he had bright red curly hair. Not sure if you are interested for your photo collection. but I have a clipping from your local paper of my grandmother at a concert in Bottesford and it shows, quite clearly, a number of other long time residents in the hall with her. I also have a photo of Maria and Walter Stanley’s wedding day photo showing the bridal couple (of course), Thomas Dent, Harry Phillips (village baker) who married my G Aunt Sarah Dent, Nellie (Ellen Dent) Parnham and Nellie’s daughter Edna Parnham. It’s a bit battered after going through the 1974 floods here in Brisbane. I’m actually in the process of photo shopping it. Very tedious business!